SMSL Q5 Pro configure high-quality remote control, remote control, all-aluminum model's own CNC machining, drawing oxidation process, with super bass (rca output), bass more shocking. SMSL Q5 Pro pure digital amplification technology, including optical fiber coaxial computer USB AUX3.5mm inputs Supports speaker output and subwoofer bass output Meets high-definition Blu-ray and HD-DVD format for demanding audio interface standard with sampling rate 44.1-192KHZ The 'Easy Start' patented technology allows precise control of the power supply circuit to improve the sound system reliability Using chips TAS5508C+TAS5342A+TAS1020B+LC89091,comes with romete control Use the key control function, or make adjustments from across the room with the included remote control. Precision-machined from a solid aluminum block, the chassis is sleek and sturdy, and its compact size (5.4 inches wide by 4.1 inches deep) minimizes clutter on your desk. The front panel features a power button, volume knob, and an easy-to-read LED digital tube display screen. 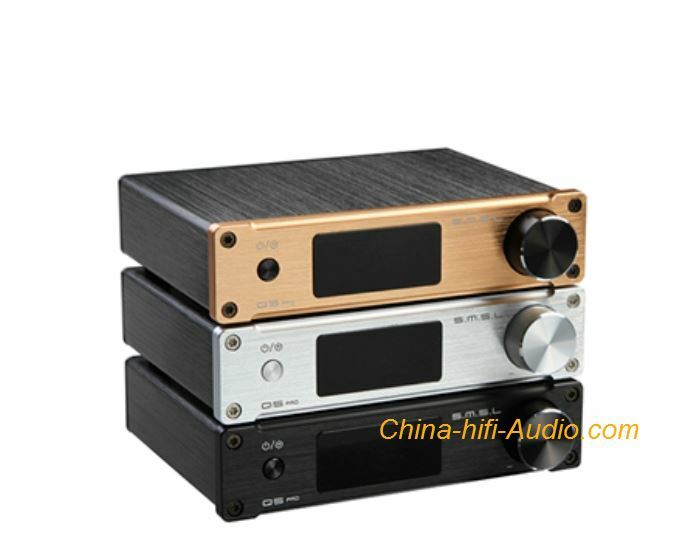 On the rear panel, you’ll find gold-plated inputs (3.5 millimeter, USB, optical, and digital coaxial), as well as gold-plated speaker outputs.